Attention Racers and Spectators !! 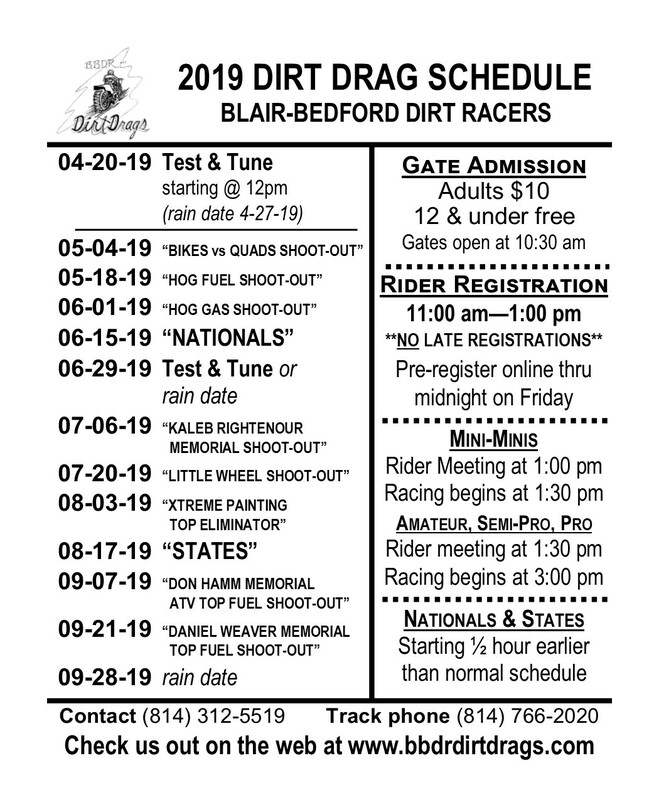 Blair-Bedford Dirt Racers, Inc. is a club of racers and racing enthusiasts that run dirt drags on a 500-foot, clay-based track located on Rte. 867 between Bakers Summit and New Enterprise in Bedford County, Pennsylvania. We race mini-mini motorcycles and ATV’s to nitro-fueled top fuel bikes and quads. With over 60 different classes to run, there is a class for everyone. All interested dirt drag racers are welcome. Sign Up Now for Email Notifications! If you would like to be notified by e-mail about race information and updates to the website, click here. Thanks for visiting our website! Hope to see you at the track! May 4, 2019 – "BIKES vs QUADS SHOOT-OUT"
May 18, 2019 – "HOG FUEL SHOOT-OUT"
June 1, 2019 – "HOG GAS SHOOT-OUT"
June 15, 2019 – "NATIONALS"
July 20, 2019 – "LITTLE WHEEL SHOOT-OUT"
Copyright 2015 BBDR Dirt Drags, Inc.